Word has just come in to The Muse Patrol that Chris Squire, founding bassist of the Progressive Rock band Yes died Saturday after a battle with Leukemia. Squire began his recording career with Yes in 1968; along with Paul McCartney and John Entwhistle, Squire was a key figure in dragging the electric bass out of the shadows of the background mix, making it a full and equal musical partner in the band dynamic. Squire was also a superior singer/composer and was a key architect in forging the airy three part harmonies that were a signature element in the Yes sound. Squire was among the first bass guitarists in Britain to popularize the Rickenbacker bass guitar. The Rickenbacker was unique due to it’s stereo electronics and futuristic (yet classic) body design. The upper registers of the instrument had a serrated twang that Squire exploited to cut through the maelstrom of guitars, keyboards and drums (in Yes) to establish his own sonic identity. 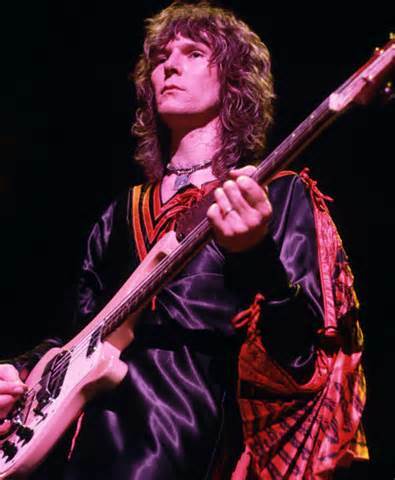 Chris Squire could be found playing a variety of cutting-edge designer basses throughout his career. But, it was the Rickenbacker he repeatedly returned to. Squire recorded and performed in the psychedelic rock band The Syn before forming Yes. 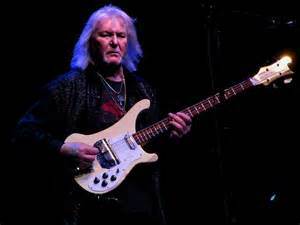 It was in The Syn that Chris Squire met guitar player Peter Banks. Chris Squire and Peter Banks – together with singer Jon Anderson – would form Yes and change the landscape of Rock Music in perpetuity. Not only did Yes introduce cutting edge technology to music making and stagecraft; they (along with other “Prog” groups) would ultimately give the late 70’s punk music movement something to rebel against. Other bands would arouse the ire of the DIY crowd, but it was Yes that would remain public enemy # 1 of the punks. Moreover, Yes would repeatedly suffer the slings and arrows of snarky music journalists when Progressive Rock fell out of fashion in the late 70’s. Chris Squire solo releases were few and far between. However, in 1975 he turned in what is considered (by consensus) the finest Yes solo album in the band’s discography when he released “Fish Out of Water”. In the early 80’s, Squire nearly pulled together one of the major super-groupings in Rock history when he and (Yes drummer) Alan White began rehearsing and recording demos with Jimmy Page. The band was called XYZ and it was Page’s stated hesitance to form a band so soon after John Bonham’s death that derailed the union. Members of Yes came and went, but until his death Squire was the one contiguous member that remained in the band from 1968 to present. He was most responsible for the band’s resurrection in the 80’s as a commercial entity (courtesy of monster # 1 single “Owner of A Lonely Heart”) when he inducted Prog-Pop renaissance man Trevor Rabin into the band. The band would fall out of fashion again in the 90’s with the advent of Grunge but would retool and reboot for a triumphant return to the Hockey arenas of yore with their 2002 Reunion featuring their their classic line-up from the 1970’s. Chris Squire was a thunderous and towering figure in the history of Rock and Roll. He leaves behind four children. The void in The Hall remains. 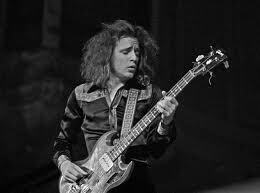 John Symon Asher “Jack” Bruce was born May 14, 1943 in Bishopbriggs Scotland. He trained in his youth to be a classical cellist but soon adapted his skills to bass guitar during the British Blues boom in the early sixties. He referred to himself as a Jazz musician and his discography reflects this eclecticism; ranging from his critically acclaimed 1969 solo album “Songs For A Tailor” to his surprising 1995 solo piano foray “Monkjack”. Bruce was already a grizzled veteran of the British Blues and Beat scenes before he ever strapped on a Gibson EBO bass for Cream. Bruce played with Manfred Mann, John Mayall and Alexis Korner before he formed the supergroup in 1966 with Ginger Baker and recently anointed “God” Eric Clapton. Cream was one of the first “jam” bands to crash the Billboard charts. They had monster hits with “Sunshine Of Your Love” and “White Room” (both featuring Bruce’s supple bass work and his honey-sweet tenor). Jack Bruce’s voice was able to sell the hits as well as the blues standards that were the backbone of Cream’s live repertoire. Moreover, his voice and playing remained strong even in his later years despite the travails of substance abuse, a harrowing 2003 liver transplant, three divorces, and financial misadventure. In Cream, Clapton got the accolades and the celebrity, but Jack Bruce delivered the panache’. Jack Bruce was a towering figure in the history of Rock and Roll despite the fact he was (sometimes) overshadowed by the Eric Clapton “brand” during his tenure in Cream. Bruce is survived by his wife and two children.